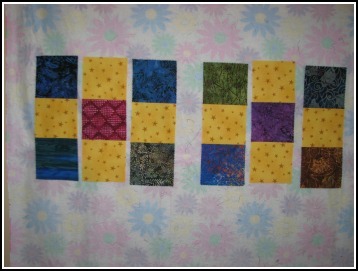 Have some fun slicing up your 9 patch blocks, put them up on your design wall and just see what happens! Because everything I do is not perfect (therefore a "calamity"), I try my darnedest to turn a boo boo into something that works. Just throw out directions, they're only a suggestion anyways! 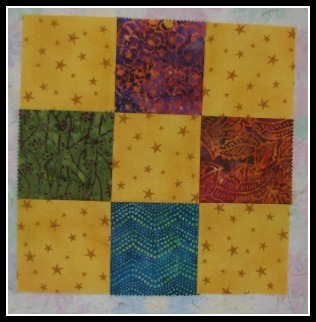 In this quilt block I used some batik charm square and pared them up with a warm bright cotton star print fabric. The effect is like a ray of sunshine in the morning, maybe a bit like the beach, but a gal in Montana can dream can't she? 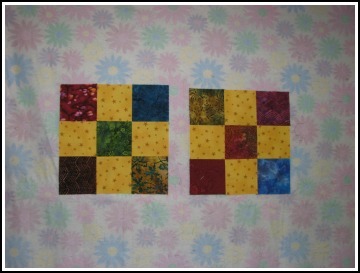 Once you get your 9 patch block put together, fold your block in half and press a little fold into each side of the block to help you make a perfect slice in half. I tried to use my ruler, but I just fussed too much due to imperfect seams lines and decided to just cut the things in half the best way I could. Whatever works for you! It never fails, I always like what I see, just imagine the possibilities! Ok, you may notice that the design wall in the background of these pics looks very happy and has the faint shadow of some bold flowers. I get vinyl tablecloths on sale, especially at the end of a season, and pin them up on the wall backwards so the flannel side is ready for my blocks to stick, works great. Now just in case you were thinking I can count, I must share that I had an accident and mixed up my 9 patch squares. 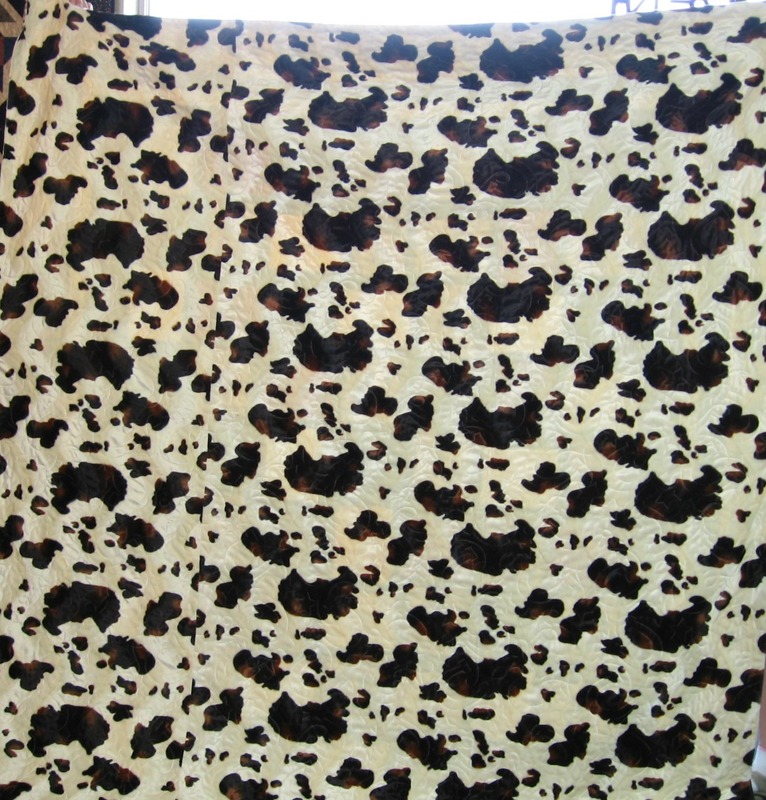 It turned out that I made some with the background color in the center and at the corners, rather than the batiks. Not to worry. 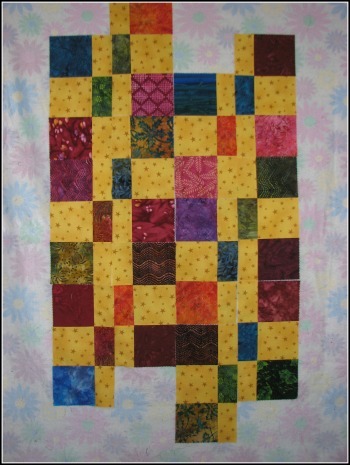 I decided this could be another cool design, so I finished making 25% of the blocks with the background in the middle, and the rest of the blocks had the batik in the middle. Once I put the blocks up on the wall, I decided on the design you see in the last picture. You can mix your blocks up anyway you want, in fact, I've seen these blocks turn out looking completely different than what you see here. I added a border and wa la (not sure that's a word). A couple of days ago the Carbon County Historical Society and Museum in Red Lodge, Montana dropped by the Quilt Lodge. They told me about their annual fundraiser whose theme this year is “The Hoedown – Outlaw Style” that will take place in September. They politely asked was there anything I’d like to donate from the Quilt Lodge to their auction to help raise funds for the museum in town? Serendipitously, I had the perfect quilt for the hoedown, my “Home of Champions Rodeo” quilt. Holy cow!! :) This past spring the spirit of the Wild West and rodeos took hold within me. 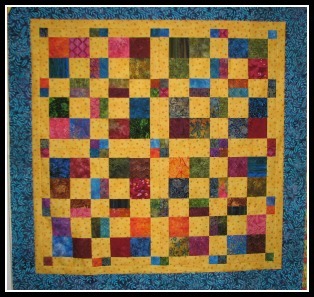 Fabrics with horse riding cowboys, cowboy boots, cowboy hats and stars fired my quilting passion. 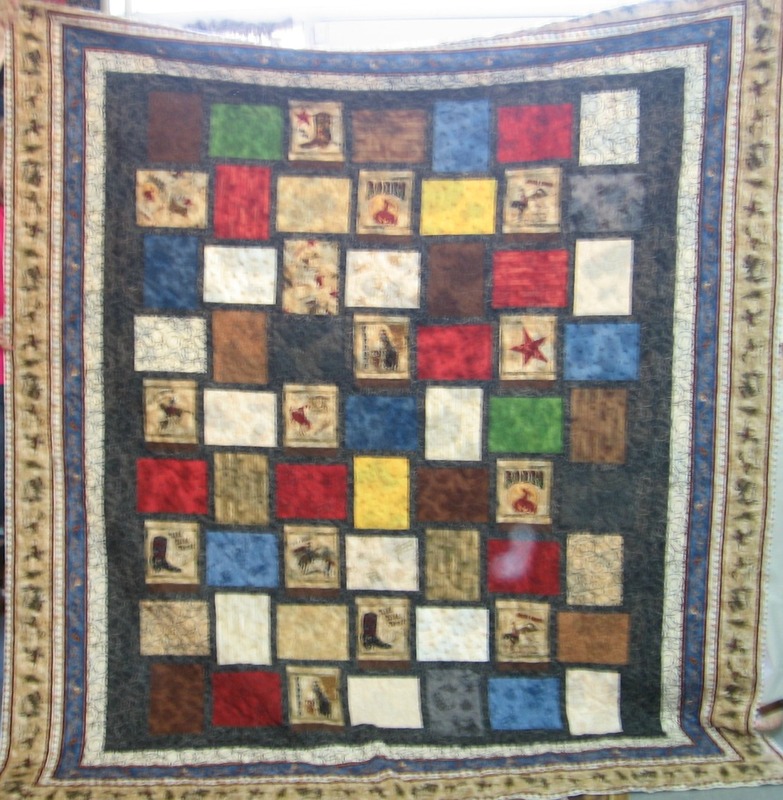 The border on the quilt is bucking broncos and cowboys. I thought “Home of Champions Rodeo” was a great name as Red Lodge hosts the annual Home of Champions Rodeo every 4th of July holiday. 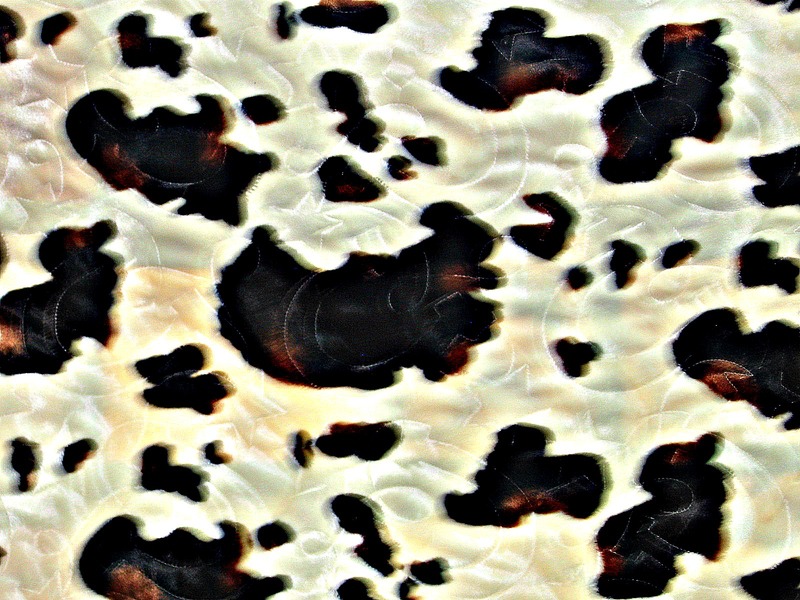 The reverse is a cowhide-like pattern which is minki to the touch. The rich and diverse history of Red Lodge, Montana is on display at the Carbon County Historical Society and Museum in the beautiful historic brick building located on the main street, Broadway Avenue. To preserve all of the local history a fundraiser takes place annually and this year’s theme is “The Hoedown--Outlaw Style”. Saturday, September 21 at Rock Creek Resort is the date for all the fun. Although not mandatory, attendees can dress according to the theme and perhaps channel one of the many colorful historical characters known to have frequented Red Lodge such as Calamity Jane or the first elected marshal John “Liver-Eating” Johnston.